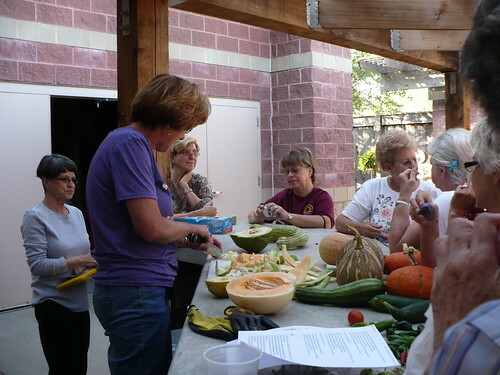 We had quite a collection of melons to taste test this week, which was a lot of fun! We actually had one of each of the 4 different melons in the garden to taste test. You can see that we’ve got quite a selection of cut up melons here on our demo table. You can see the pure white flesh and the tiny bit of color showing up around the seeds. It was still perhaps a week under-ripe, but it was much sweeter and more flavorful than last time we tried it. Next up was the honeydew melon. We also tried one of these a few weeks back that wasn’t quite ripe. This one we made sure had changed color and also had a more waxy feel to the skin. There’s the inside. Definitely a better orange color than before. 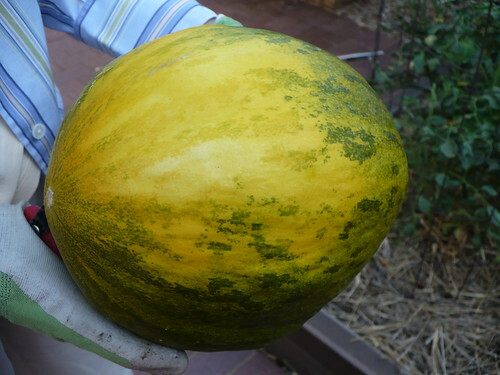 Like the Lambkin Melon, this Honey Orange honeydew melon could maybe have stood 1 more week on the vine. However, it was much sweeter and more flavorful than before. 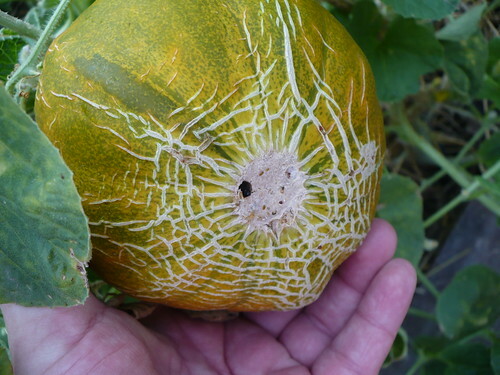 Unfortunately, the only other melons still on that vine look like they are infected with some sort of virus, as the leaves are mottled and the fruit are deformed. 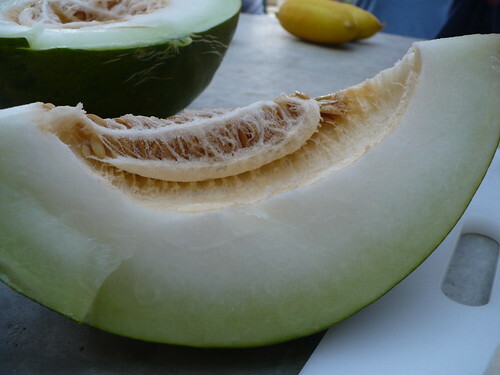 The third melon was the Kazakh melon, which is an heirloom. I had grown in when I worked in Ohio, and it was a super sweet, very floral tasting melon. This one wasn’t as yellow as I remembered it being, but it has kind of been sitting and not getting more yellow for a week or more, and there was some insect that looked to have taken up residence in the bottom of it. (Do you see the hole?) Time to cut it open! Here’s what it looks like from the inside. You can see the darker ring towards the rind, indicating that it maybe isn’t as ripe as would be ideal. 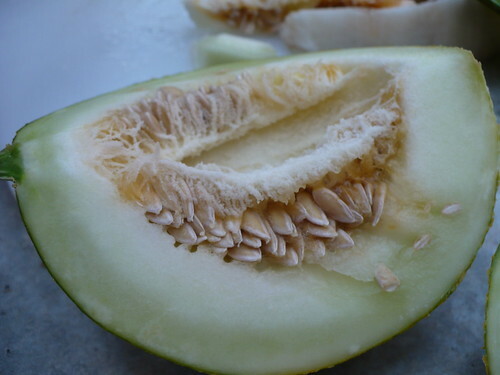 The other thing you might notice, if you compare it to some of the previous pictures, is that the seed cavity is much larger and the flesh is thinner. 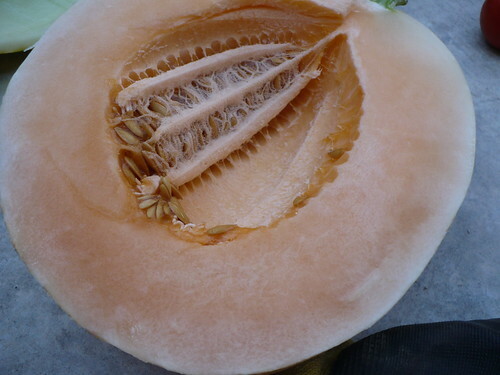 This is very typical of an heirloom melon. Again, not quite as sweet as I remembered it, perhaps under-ripe. However, it was one that almost everyone really liked when trying it! It is still a little crunchy and has a very unique flavor. The other melon we tried was the ‘Tasty Bites’ cantaloupe, which we’ve tried before and is always very tasty! It is also far and away the most productive melon in the garden, although the vine is pretty much done producing at this point. It does have 3-4 very young melons that are not anywhere near mature yet at the very top of the trellis. Most of the others seem to have set some melons early on but have not continued attempting to produce. 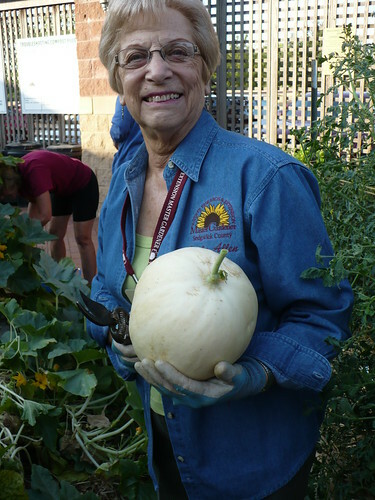 Posted on August 22, 2012, in Harvesting & Eating, PhotoEssays and tagged harvest, melons. Bookmark the permalink. Leave a comment.